The 2013 Audi A3 offers the versatility of a small hatchback, the year-round driving security of all-wheel drive and a luxurious interior befitting its Audi heritage. Although it's priced far above the average VW or Subaru, the A3 isn't just a compact car with a luxury badge, it's a true premium driver's car worth every penny. Best car manufactured by Audi . The TDI engine is very responsive and low in noise and delivers good fuel economy too. The S-tronic transmission with the dual clutch is truly amazing and its fast in tuning up with a change of gears, with virtually no change in vehicle speed between changing of two speed It's a wonderful car with tremendous performance and luxurious interiors. However in terms of cost, it looks bit high as compared to its rivals. The panoramic sunroof, leather interiors and the advanced infotainment system makes worth the money spent. Best car manufactured by Audi . My vehicle is compact, sleek, efficient, and exactly what you want out of a car. There are no problems with my vehicle it runs very smoothly and it is very comfortable. There was one problem with the breaks because we got it used but we got it fixed and now it runs smooth as butter. It does not have all the high tech features of a brand new car but it has all of the necessities and I am really happy with it. It sounds dope, and it drives well. Its good and stuff, I mean it gets me to point A to point B without any problems really. I've never had to fix anything on probably because I only drive it around my general area. I usually drive it to the store, work, the cigarette store the beer store you name it and it hasn't caused any problems, it sounds great to. 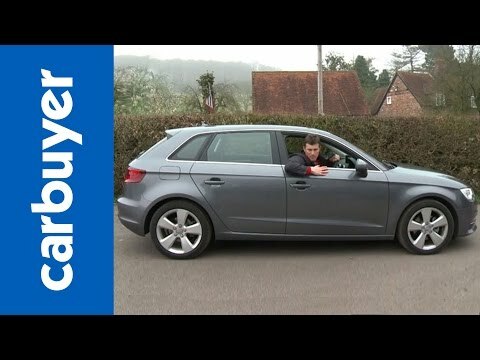 2013 Audi A3 Sportback review - What Car?